What causes an estimated 90,000,000 bushel yield loss of soybean in the North Central U.S. each year? What can cause an eye-popping 30% yield loss without above-ground symptoms? What can move any way that soil moves? What can invade a soybean plant and worsen brown stem rot and sudden death syndrome symptoms? Some farmers are still unsure of what percentage of their northwestern Minnesota fields are infested (incidence) or to what degree (severity). This is true even for Polk County, the largest soybean producing county in the state (USDA-NASS, 2017). Soybean has been making steady in-roads as an alternative crop, resulting in 3,564 more soybean fields and 328,964 more soybean acres in northwestern Minnesota counties (Clearwater, Kittson, Mahnomen, Marshall, Norman, Pennington, Polk, Red Lake, Roseau) in 2016 compared to 2012 (USDA-FSA, 2017). Growing soybean after soybean has been common in this area even though the practice has the potential to create serious problems with managing SCN and other pests and pathogens. Research has shown that alkaline soils, which are common in northwestern Minnesota, can support 3.8-fold higher SCN populations than more acidic soils (Pedersen et al., 2010). Combined, these data suggest that the Northern Red River Valley is at particular risk for developing and sustaining yield limiting SCN populations. There is a different concern in fields that have been infested longer with SCN. Repeatedly growing soybean varieties with the same PI 88788 source of genetic resistance to SCN has, in some instances, resulted in adaptive population shifts. These SCN populations are able to reproduce better on varieties with the PI 88788 source of resistance. Over time this phenomenon results in increasing SCN population densities even when using resistant varieties, robbing plants of the water and nutrients that would otherwise be used to fill pods. 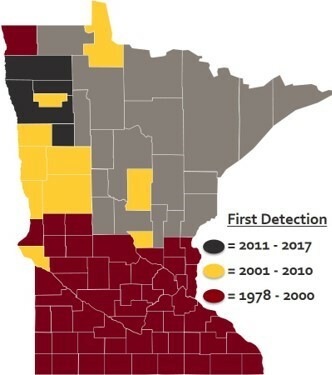 In 2018, University of Minnesota Extension aims to increase awareness about the importance of soil sampling to SCN management through a Minnesota Soybean Research & Promotion Council-sponsored SCN sampling and education program. Research-based management recommendations based on their sample egg count. To participate in this free sampling program and to receive additional information, including sample bags and instructions (quantity limited) contact Angie (apeltier@umn.edu). Using average expected per-acre soybean yields and market prices, NDSU plant pathologist and project cooperator Dr. Sam Markell estimates the economic value of SCN detection (and subsequent management) to be more than $25,000 per sampled field (Markell, 2015). Despite the importance of monitoring and managing SCN to maximize soybean production, many producers remain unaware of the threat that SCN poses or how essential both monitoring and management are to maintaining crop productivity. Stay tuned in the coming year for SCN-related information to appear in University of Minnesota Extension’s Crop News Blog and/or at Extension programs. For more general information about SCN, consider visiting www.thescncoalition.com a website specifically dedicated to SCN and developed by a coalition of Universities, check-off organizations and corporate partners. Additionally, an informational Soybean Cyst Nematode website is available from U of MN Extension.